The exhibition Artists, Architects and Artisans: Canadian Art 1890-1918, organized by the National Gallery of Canada, brings together some 320 artefacts from both public institutions and private collections across the country. The beautifully displayed objects represent the artistic achievements of a period following the completion of the Canadian Pacific Railway in 1886 to the end of the First World War—epitomizing three decades of remarkable transformation and growth. Still Life with Lay Figure by Ozias Leduc (fig. 1), a small oil painting on cardboard, hangs in the first room. 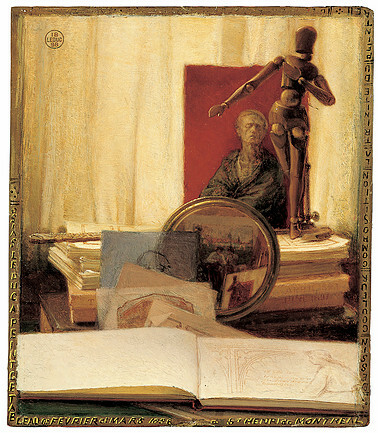 Exhibited opposite to the artist’s more famous painting The Young Student, this work depicts a sketchbook, drawings, periodicals, a wooden model, an oil sketch and a mirror facing the exhibition room and thus the viewer. The work becomes a metaphor for Artists, Architects and Artisans: Canadian Art 1890-1918 as it alludes to the diverse mediums and artistic processes found within the exhibition. (fig. 1) Ozias Leduc, Still Life with Lay Figure, 1898. Oil on cardboard. The Montreal Museum of Fine Arts. Gift of the Succession J.A. DeSève. Photo MMFA. A total of fourteen rooms accommodate this rich collection. However, the highlights of the show are not the works by Ozias Leduc, Tom Thomson or Lawren Harris—some of Canada’s most celebrated artists. Rather, the stars of this exhibition are the drawings, sketches and design plans—many unrealized—by lesser known artists and workshops. It is within these works, some grand in scale and others mere miniature versions of their final self, that one is able to observe the artists’ hand, complete with notations, workshop stamps or markings, and reworked lines. The exhibition ends with a grouping of urban plans for Montreal, Calgary, Ottawa, Regina and Edmonton. Following the ‘City Beautiful’ movement, which grew from Chicago’s World’s Columbian Exposition of 1893, the sizeable room presents a dozen magnificent plans proposed for Canada’s urban cores during a time of considerable growth and optimism. The plans for Edmonton and Calgary are particularly interesting. The proposed gates and formal grounds for the University of Alberta (fig. 2) resemble those of the Palace of Versailles, complete with a garden front facing the North Saskatchewan River. Sections of the Calgary plan echo the streetscapes of Paris—a version of the Petit Palais and the Pont Alexandre III for a crossing of the Bow River are included. To counterbalance the designs of these grand monuments and imperial planning schemes, the exhibition inserts a number of photographs including those of Sydney Carter and M. O. Hammond (fig. 3). Their small scale and unidealistic subject matter become a welcome reprieve. Carter’s soft focused portraits and Hammond’s pictorial landscapes of industrial, man-made, steel structures counteract the ambitious designs proposed in exhibition rooms before and after. (fig. 3) The Hand of Man, Melvin Ormond Hammond, 1909. Bromide print on paper. Art Gallery of Ontario (85.163). Gift of Mr. Skip Gillham, Vineland, Ontario, 1985. Copyright: Art Gallery of Ontario. The presentation of the artefacts—objects made of rich woods, handcrafted metal works, bronze fountains and delicate architectural and furniture plans—is simply superb. Despite the large number of artefacts included, none of the rooms feel crowded. The presentation of the interior lamps from the Bibliothèque Saint-Sulpice, Montreal, the oratory of the J. T. Davis residence, Montreal, and the baptismal font—more specifically, the font bracket and font top—from Saint James Church, Trois-Rivières, are impressively incorporated into the exhibition spaces and become the focal points of their respective rooms. It is surprising that a handful of reproductions, mostly works on paper, are included in the exhibition. The thinly framed copies stand out. Their new, crisp surfaces and untrue scales distinguish them from the rich textual quality of the original works on paper—many of which are on loan from the John Bland Canadian Architecture Collection, McGill University Library. Perhaps the printing of these reproductions could have been limited to the catalogue. Hill and his curatorial, design, installation and collections management team found the right balance and were able to transpose both proposed and realized projects from across Canada to fourteen rooms on Sussex Drive. This is a remarkable feat. A richly illustrated 340-page catalogue, with essays by Christine Boyanoski, Charles Hill, Andrea Kunard, Laurier Lacroix, Rosalind Pepall, Bruce Russell and Geoffrey Simmins, accompanies the exhibition.